One of the options the Federal Emergency Management Agency is offering qualified families who were severely affected by Super Typhoon Yutu is a transportation assistance program that will enable them to avail of temporary housing and shelter. For that, they would have to move elsewhere, like to another territory or a state in the U.S. mainland. As of the latest count, a total of 454 homes on Saipan and Tinian were impacted by the typhoon, with 468 sustaining major damage. David Gervino, the external affairs officer of the FEMA-National Incident Management Assessment Team, told Saipan Tribune that the program would enable qualified families or individuals to fly to another place within the United States for shelter. “Whether that’s through the transitional shelter assistance program where people will be able to stay in hotels or if they have family members in the [U.S.] mainland or somewhere else they would want to go. 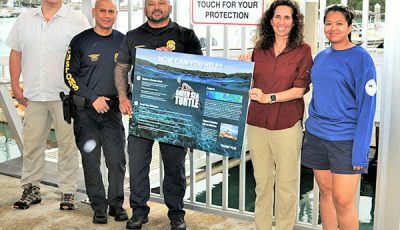 It is a very specific program and there are certain criteria that has to be met,” said Gervino, who was one of the guest speakers in the Saipan Chamber of Commerce meeting yesterday. CNMI Homeland Security and Emergency Management public information officer Nadine Deleon Guerrero, U.S. Small Business Administration information officer Cynthia Cowell, SBA field operations specialist Victor Peralta, and American Red Cross job director Adam Runkle were the other guests in the Chamber meeting yesterday at the Hibiscus Hall of the Fiesta Resort & Spa Saipan. As he explained it, Gervino said that FEMA’s individual case workers are calling families, households, or individuals that qualify for the program to explain to them in detail if they want to take avail of it. “But there are certain restrictions, such as you have to travel and be away for 60 days or more,” he said. The program is just one of FEMA’s options. People usually want to rebuild their damaged homes, he added. Bryan Aquino, an employee in a local tour agency, is one of those who availed of the transportation assistance program after their apartment in San Antonio was leveled by Yutu’s winds. He is scheduled to leave on Dec. 16. “A FEMA personnel called us and explained the program. My brother and I decided to take advantage of the program while our father decided to stay here with some of our friends on Saipan,” Aquino told Saipan Tribune. FEMA would shoulder one’s hotel stay for 10 days as you try to look for a temporary apartment, house, or shelter. They would also provide the airplane ticket to the place where you will be staying temporarily. FEMA also has a temporary roofing program called the Temporary Emergency Tent and Roofing Installation Support program or TETRIS. “Another option is the TETRIS program where we are putting up emergency and temporary roofing, providing tents, and other options for people so that if they do want to stay close to their homes, these are the available options for them,” said Gervino.